The Gospels say that the Messiah must be the son of David. This title was given by the people to Jesus during the reception into Jerusalem with palms before His death. Neither the High-priest, nor Pilate accused Jesus of the title 'Son of David' because his Davidic ancestry was beyond dispute. 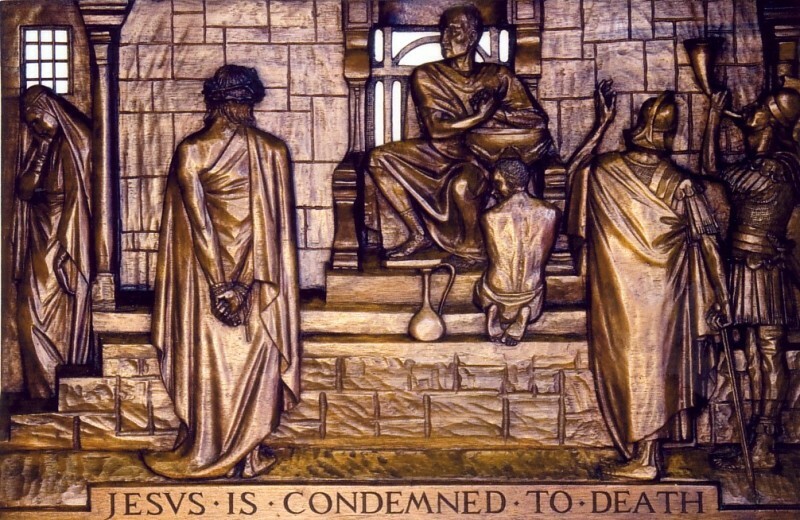 The Church recognises that Pilate’s vacillating position is complex in these events. 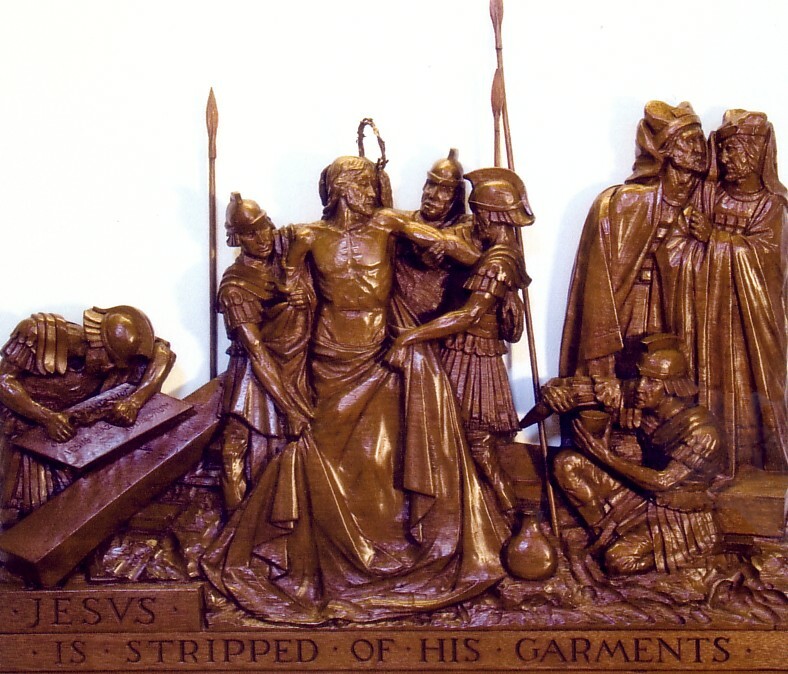 The Ethiopian Church honours Pilate as a saint “who washed his hands of the blood of Jesus Christ” …and… “Pilate gave (Joseph and Nicodemus) permission to carry the body of Jesus away”. Pilate’s wife, traditionally called Claudia (Procula), is venerated as a saint by the Greek Church. Claudia sent Pilate a message urging him to have nothing to do with this trial because she had dreamt that Jesus was innocent. She became a Christian after the crucifixion. In the carving Jesus stands with his hands bound before this complex man. Pilate called him ‘the King of the Jews’ and he was indeed a king, unjustly accused by his enemies and accepting his death sentence with royal dignity. Where Pilate’s house once stood in Jerusalem, a Church was later built in honour of The Wisdom of God. 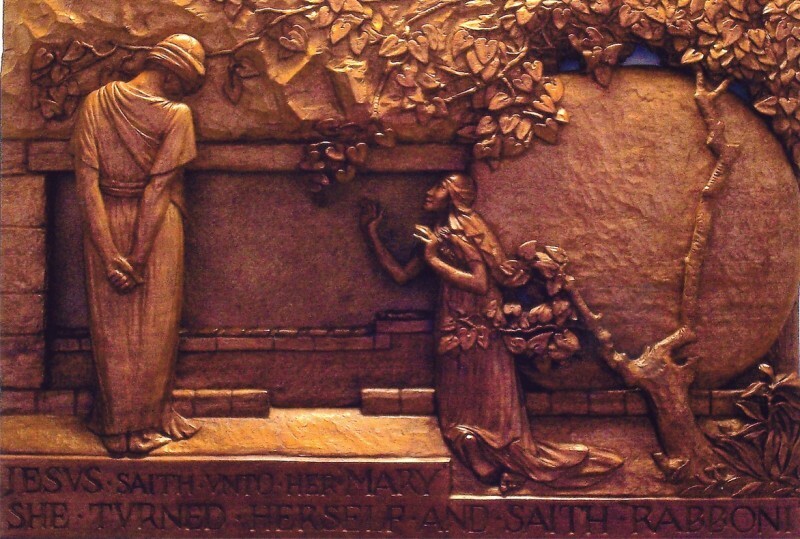 In the top left of the panel a grieving woman stands. 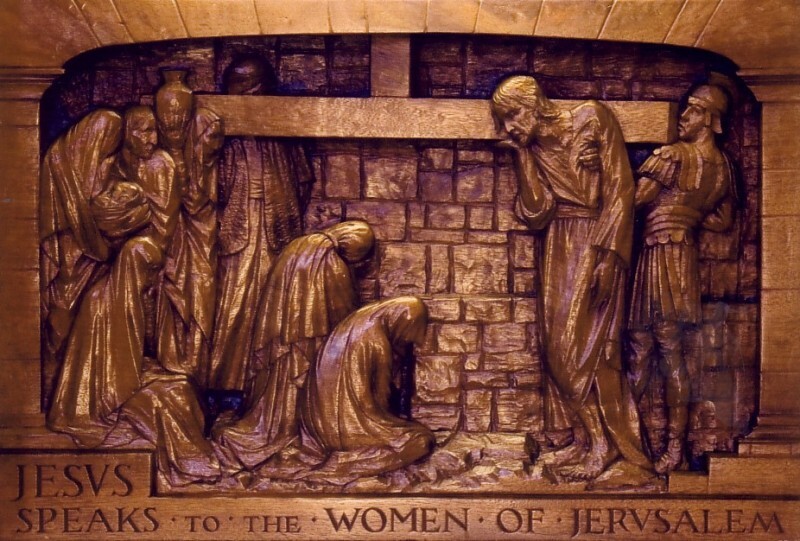 Tradition tells that the Holy Women who followed Jesus witnessed this trial, as they had also witnessed the flogging. In oral tradition Jesus is said to have gone eagerly forward to receive the cross with three kisses and to embrace it in his arms. The early Saints contrast this with the way Adam, the first man, went eagerly forward to embrace the tree of the knowledge of good and evil in the garden of Eden. We do not know whether it was just the transverse beam or whether it was the whole cross but it was a heavy load to take on lacerated shoulders. Tradition says that the wound on Christ’s shoulder from this weight caused him more pain than any other, so deep was it to the bone. In this series of carvings, three falls are portrayed. Various traditions refer to more than three falls of the Saviour. Jesus was given no superhuman strength to carry him through the events of the Passion. He was willing to show human weakness, because he was true man. As St Paul tells us ‘He emptied himself, taking the form of a slave’. 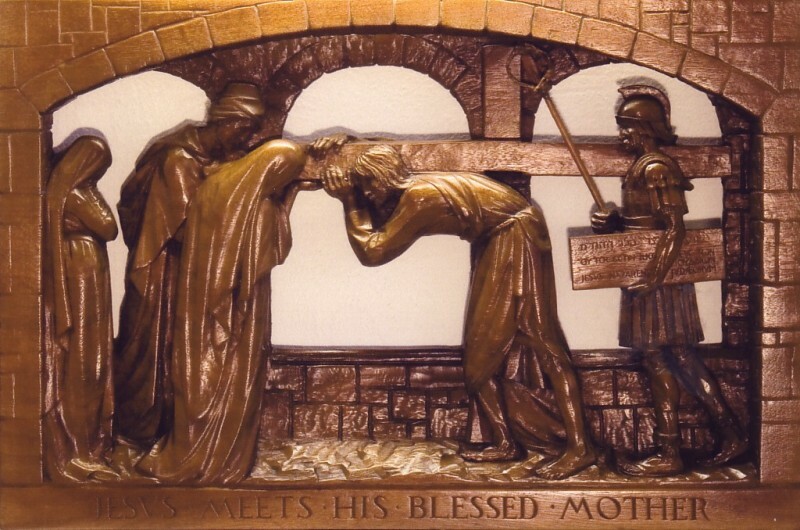 In this Station, the Mother and her Son gaze at each other along the cross beam. Both have their hands on the wood. John the Evangelist and the Holy Women mentioned in the Gospel narrative must have been with the Blessed Mother as she drew near to greet her Son. Luke in his Gospel records the prophecy “and a sword will pierce your own soul also…” was it not true then that her share in the Passion of her Son was unique. On a human level, tradition tells us that the greatest suffering of the Mother of Jesus was in her sense of utter helplessness to alleviate the agony of her Son. Here she tries to help Him to hold up the cross beam. How important this symbol is. This panel is the first to show the Apostle John who, with the Holy Women, stayed close to Jesus wherever possible. Tradition tells us that the other Apostles hid in a cave in or near to what became known as the Field of Blood after the arrest of Jesus and during His trial. St Mark (15.21) mentions this episode. Tradition records that Simon the gardener had his two sons, Alexander and Rufus, with him when he encountered the exhausted Christ. He was coming in from working in the fields. According to legend they all became followers of Jesus. 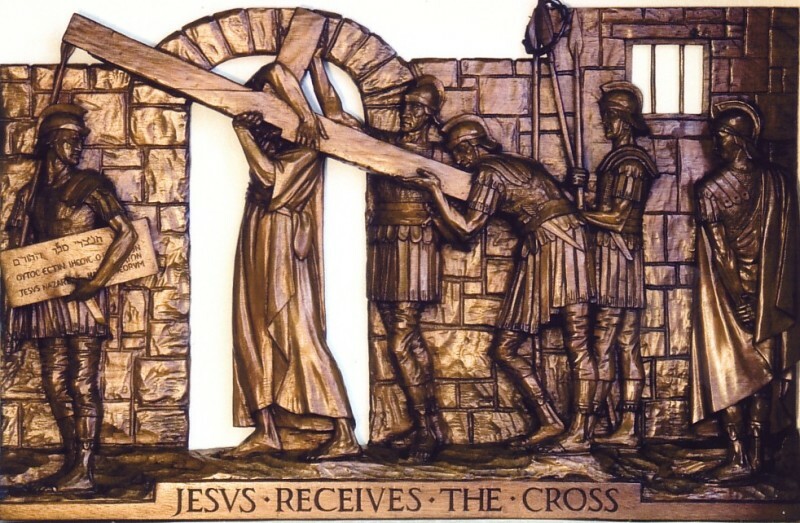 Whatever Simon may have felt at the moment he was forced to shoulder this cross with Jesus, by the time they arrived at the hill of crucifixion, Simon was a changed human being. The force of his experience in that task, and the depth of experience of being so close to Jesus in it, opened his whole being to Divine Love. Tradition has handed down that having arrived at the summit he was reluctant to leave our Lord alone on Golgotha. Afterwards he joined the disciples. Simon is now yoked to Our Lord by the cross beam and the central figure of the panel is Veronica in her encounter with the Saviour. The name Veronica means vera (true) ikon (icon = image). 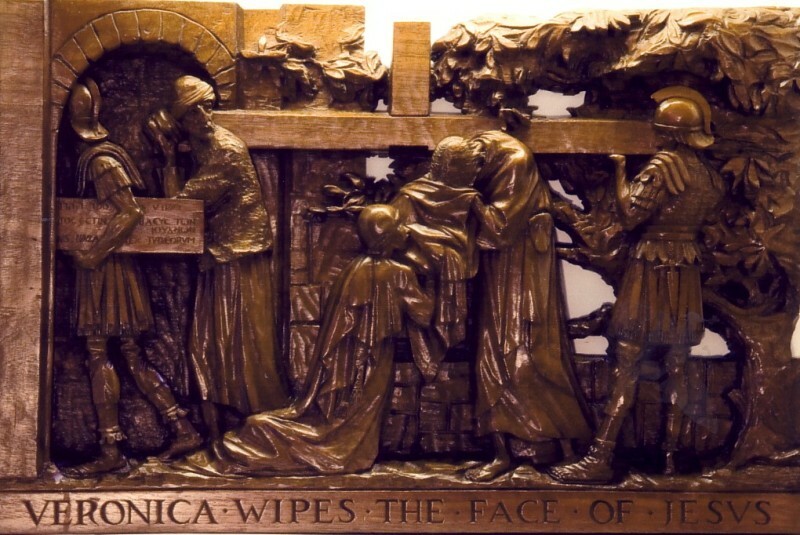 Veronica meant her gesture intensely and in this she reminds us of other women in the Gospels who rendered services of love which the onlookers despised as useless: the woman who wet the feet of Jesus with her tears and wiped them with her hair; the woman who broke an alabaster jar of precious ointment and poured it on his head. From apostolic times the oral tradition preserved on the island of Malta (where S Paul was shipwrecked) states that Veronica had two young girls with her at this encounter and that they carried a cup of wine to strengthen the exhausted Lord. Also that Veronica used a linen cloth to wipe the blood from his bruised face. The impression left on the cloth of the Saviour’s face is one of the sindone which the Church has treasured down the centuries. This is another of the falls depicted on the road to Golgotha. Simon the cross bearer experienced and shared each movement of the Son of God. 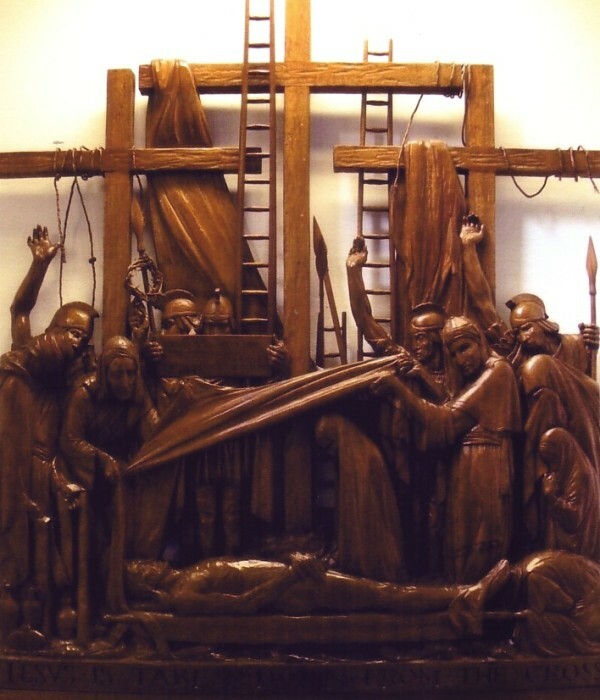 In the panel, as Jesus fell, Simon clung to his part of the beam. 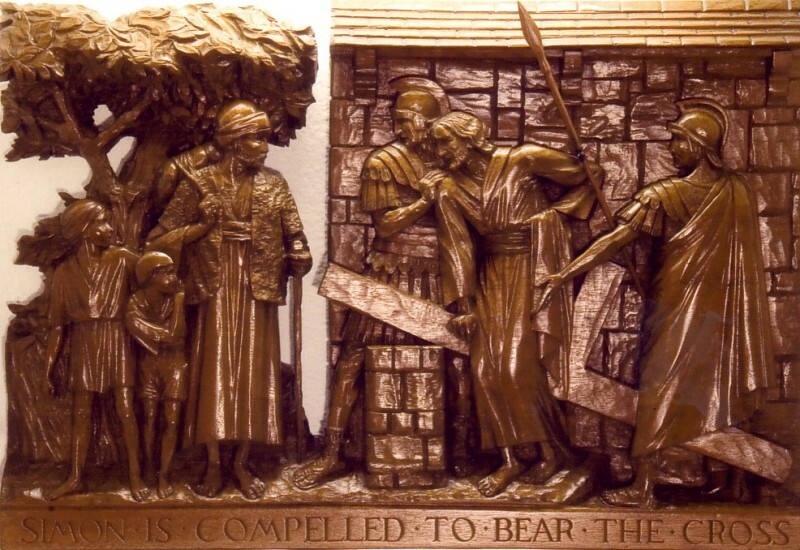 There are other depictions in which Simon is seen trying to support both the cross and the Lord who is stumbling. The weakness that the Lord experienced after so much torture expresses how he suffered the Passion in his humanity. He did not call on his Father to send angels to help him, though surely angels were present to strengthen him at certain points, as in the Garden of Gethsemane. However, the Church teaches that he suffered in his humanity and was indeed fully human except that he was free from sin. In this second fall, on the actual Via Dolorosa in Jerusalem, the point is marked where Jesus left the walled city and was led outside it to the place of crucifixion. Scripture says “He suffered death outside the city walls”. St Luke is the only evangelist who tells us about this encounter on the way to Calvary. Jesus says to the women, “Daughters of Jerusalem, do not weep for me but for yourselves and your children. For behold the days are coming in which they will say, ‘Blessed are the barren and the wombs which never bore and the breasts that never suckled’”. Only a few days before, Jesus himself wept over Jerusalem as he rode into the city. We know that forty years later Jerusalem was indeed destroyed. Our Lord’s words to the women are consoling, protective, warning them of future suffering and the length of his discourse with them is significant. There is a genuine gratitude for their compassion. This is not, as some have suggested, a cynical hired group of professional mourners. As Jesus speaks to them, you can see Simon of Cyrene in the left corner among the women. It is already symbolising that Simon would join the disciples. Tradition tells us that some of these women were already the followers of Jesus. Here, at the third fall, Jesus is portrayed stretched full length in the dust. It is as if Jesus is accepting the full reality of the love in the heart of the Father which inspired Him to create Adam out of dust. In Hebrew ‘adamah’ means dust. Adam was created by God in love, for love. Into this dust the Spirit was breathed and the dust became a living being. The Son of God took this flesh, this dust upon Himself and became the second Adam. He is now stretched upon the earth in extreme human weakness. The Father will raise Him up in the end but this is not yet. It is not yet over. 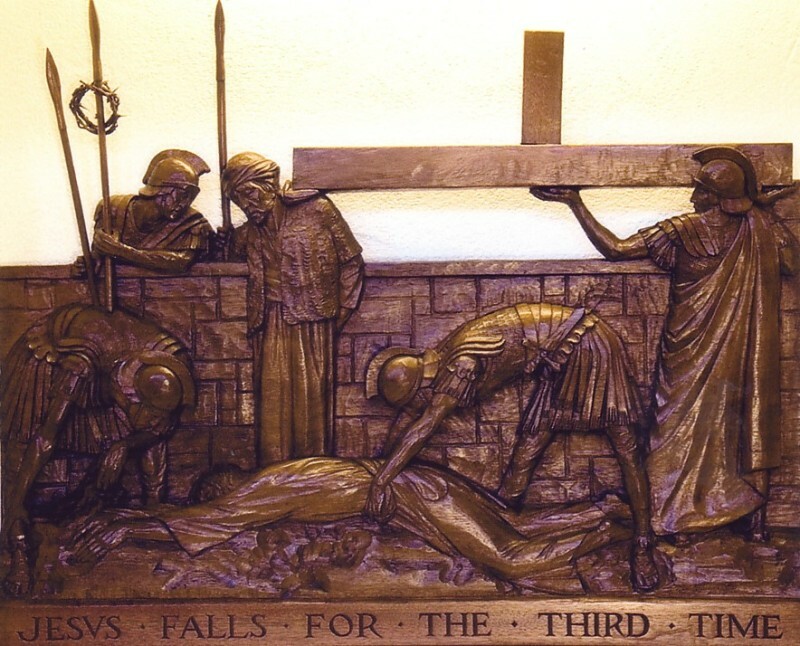 For the moment Simon the cross bearer stands over Him watching in compassion. The next panel will be on the mount of Calvary itself with the actual crucifixion about to begin. With this station the final phase of the Passion begins. With deep serenity Jesus had laid aside his garments to wash the disciples’ feet at the Last Supper but now they are brutally torn from him and divided among his executioners. This is Golgotha, the place of a skull. We know from the Gospels that John and the Holy Women were with the Mother of Jesus on the summit of Golgotha for this phase. One of the traditions of the Church tells us that a great part of the suffering of the Mother of Jesus at this moment was the sense of being left behind. Events were marching forward and He was going on ahead of His people to “prepare a place for them” through death. On the top right of the panel two members of the Council talk together. In this panel John, the Mother of Jesus and the Holy Women are all present and suffering the impact of this terrible moment. Tradition says that the Mother of Jesus was shielded in some way during this hammering and in the carving she shelters behind the sensitive young Apostle and is supported by one of the Holy Women. 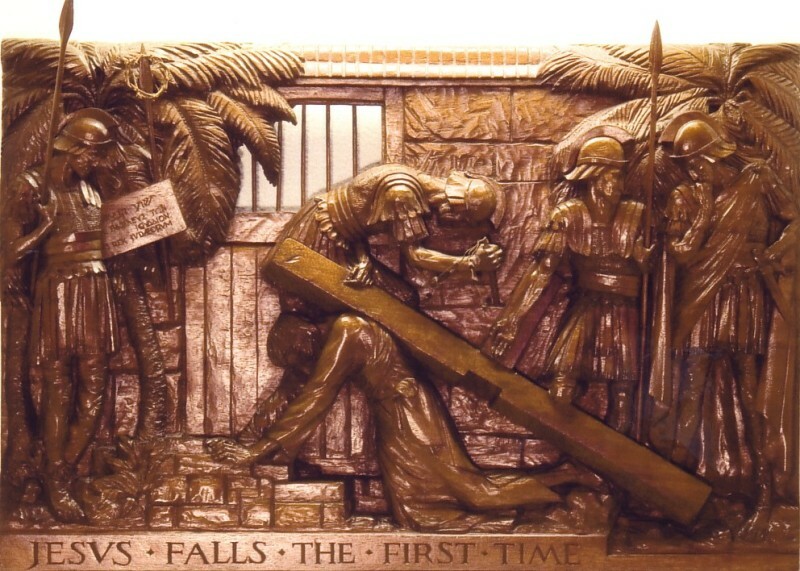 The cross is being raised as the feet are nailed. Legend says that as the cross was raised into place in its fissure on Calvary the Temple trumpet sounded for the sacrifice of the Paschal Lamb. There is a mystical tradition that in the Wounds of Jesus there were opened anew in the human body portals of light which had been closed by Adam's sin. 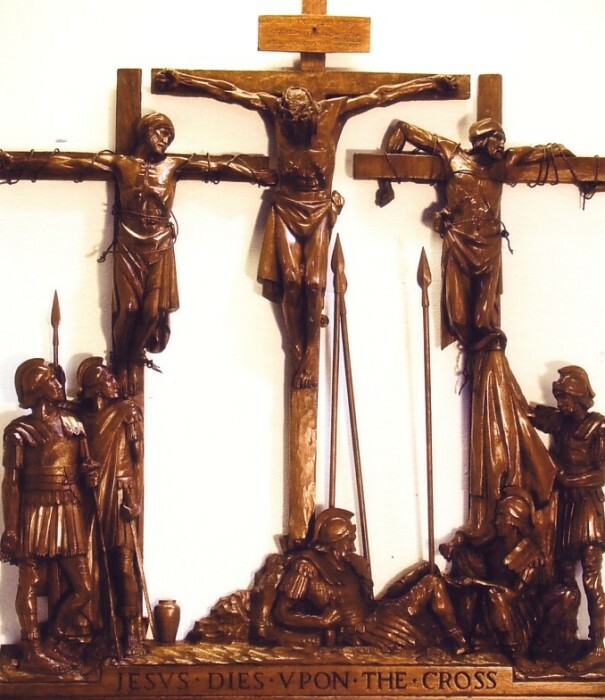 The carving shows Our Lord between the two thieves who were crucified with Him. In order to hasten death the legs of the two thieves were broken, whereas Our Lord’s were not. The hands of Our Lord are contracted around the nails which pierce them, the muscles of his arms bunched tightly with strain. The crown of thorns, mentioned by three of the Gospel writers, is still on his head. The soldiers are portrayed playing dice for the robes which had been stripped from Christ. From the cross Jesus said “I thirst”. This is not only human need in extreme physical suffering but also a Divine need. Jesus was expressing the thirst of the Godhead for the beloved humanity which had fallen into sin, to redeem and restore it. He also bequeathed His Mother to John the Evangelist, that under his protection she might be a Mother to the Church and a wise guide to the young Community. In the last great cry from the cross, Jesus commends his Spirit into the hands of the Father and bows his head in death. The Gospel records that the soldier, seeing that Jesus was already dead, thrust his spear into His Sacred Heart. The spears are leaning close to the body of Jesus as if in anticipation of this historic act which the Evangelist records in detail for posterity. In this panel the Mother of our Lord is kneeling beneath the shroud which is being lowered upon the body. This would seem to be symbolic of her unique sharing in the Passion and death of her Son. The faithful women are gathered in the right corner. The Magdalen is at the feet of Jesus. The sensitive and loyal Apostle John bows his head in his hands in grief on the extreme left. Joseph of Arimathea and Nicodemus who had asked Pilate for the body of the Lord are performing these last offices. Behind the gathered faithful stand the Roman soldiers who have been converted by what they have seen and heard, raising their hands to salute the Son of God in death. The disciples of the Lord are shown in the carving hastily and lovingly laying him to rest before the Sabbath began. The stone is rolled over the sepulchre, the faithful John at the forefront. The women who have been present throughout were there to assist and they intended to return after the Sabbath to complete the embalming. Our Lord was placed in the tomb of Joseph of Arimathea who by tradition was a stone cutter and had a garden in this quarry in which the rock face of Calvary stands. This is the Suffering Messiah of the book of Isaiah, resting after his redeeming work. 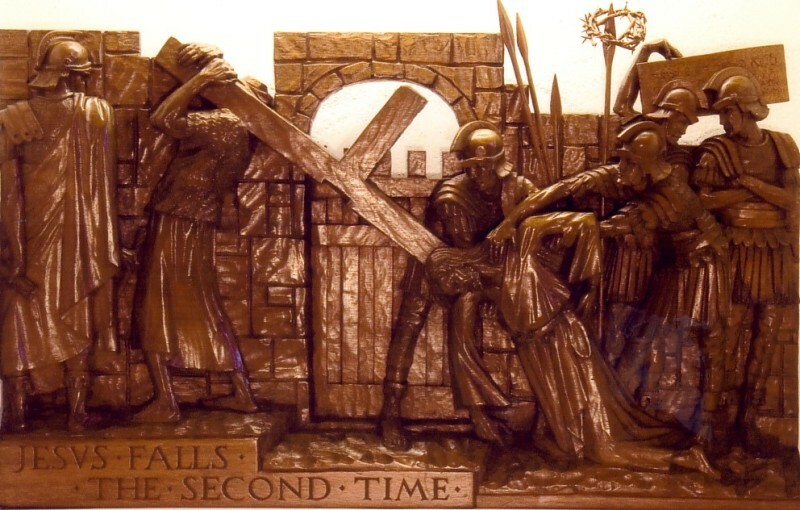 The Church holds that during this time of rest, Our Lord’s Spirit entered the realm of the dead to release those long waiting there for their redemption. This is called the Harrowing of Hell and is portrayed as the victorious Christ crossing over on his cross to lift out of darkness the souls of the just, beginning with Adam and Eve. The Mother of Jesus at this moment when the stone is rolled over the grave pondered the prophecies that her Son would rise from the dead. 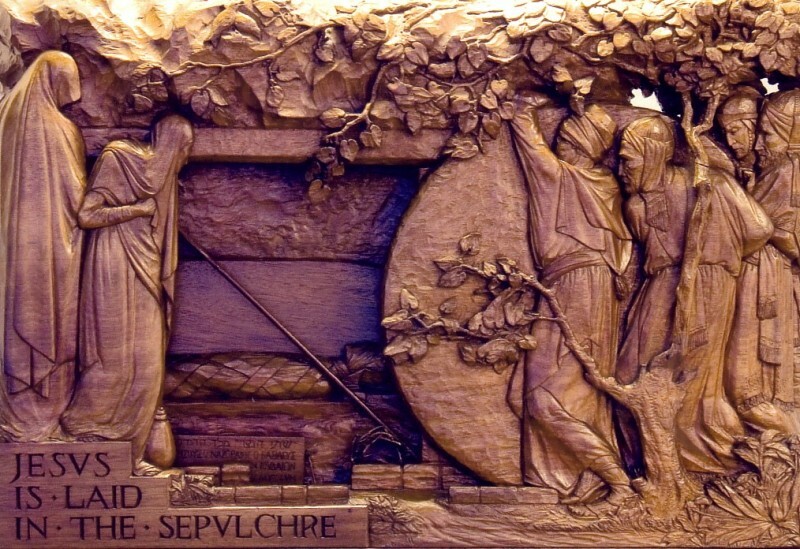 The Saturday which follows this burial of the Lord is traditionally understood as a time of waiting for the promised Resurrection and the time of the sorrow of the Mother of God. 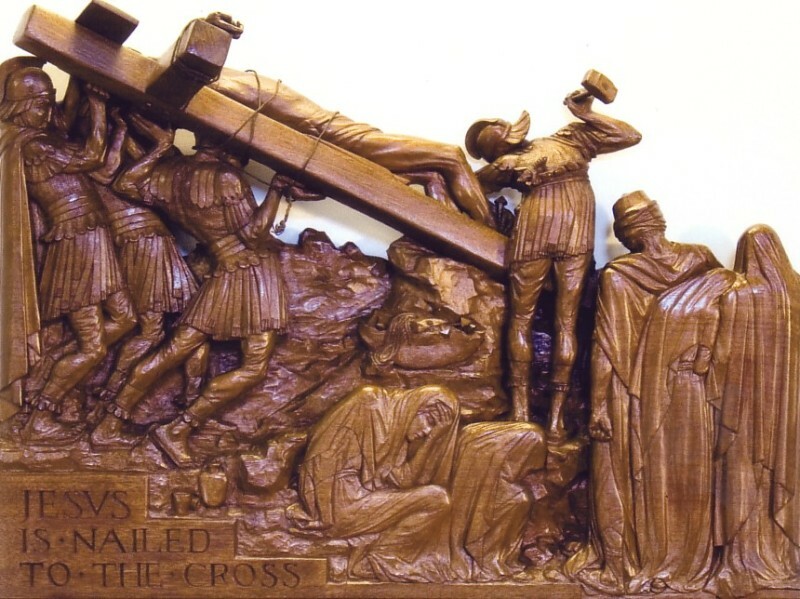 This additional carving carries us beyond the Passion to the Resurrection of Our Lord. He stands to the left of the panel robed like a gardener, with Mary Magdalen reaching out to him in surprise. This meeting is recorded in the Gospel of John. Mary had come with other myrrh bearing women to complete the anointing of the body of the Lord, only to find the tomb empty. Jesus tells her not to touch him for he has not as yet ascended to his Father. There is therefore that sense of distance in the posture of Jesus as if standing apart from her. He tells her to go to the Apostles and tell them that he is returning to the Father. For this task given to her, history has recorded the Magdalen as the “Apostle to the Apostles”. 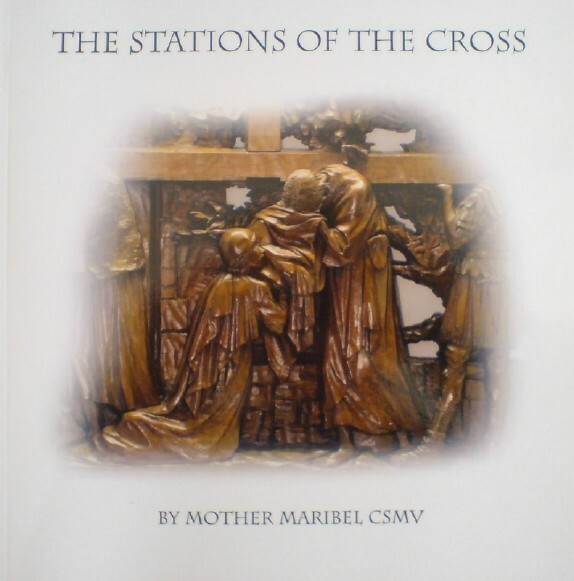 A book entitled "The Stations of the Cross" giving further photographs and information is available from the Convent.